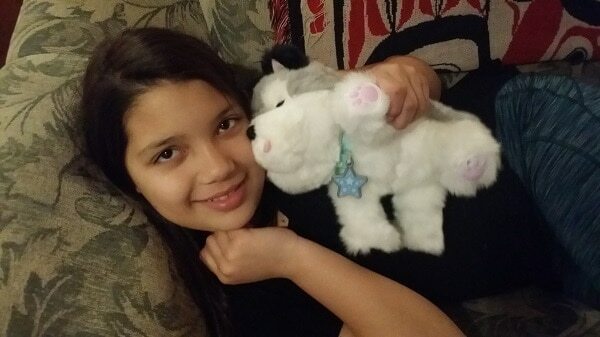 My Little One adores animals including dogs. She has been asking for us to get another puppy since our dogs passed away a couple of years ago, but we are so busy and just not ready for a little puppy right now. However, we certainly are ready for an adorable little puppy called My Dream Puppy Frosty. Frosty is a Little Live Pets product. So this is what Frosty looks like when sitting up normally. 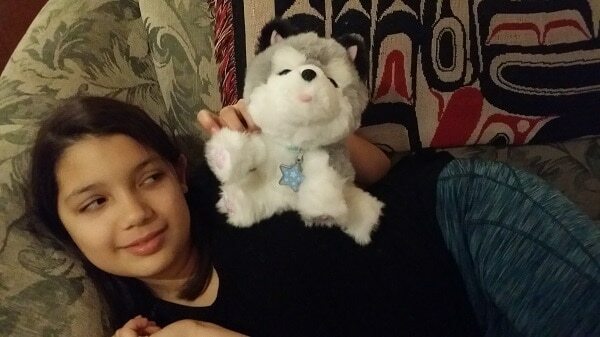 The Little Live Pet Husky Dream Puppy makes the perfect first pet! More than just a toy, he moves and feels just like a real puppy! You will fall in love with him the minute he opens up his big blue eyes. He is so lifelike! This beautiful little Husky even comes with an adoption certificate so you can truly make him your own! My Dream Puppy Frosty is recommended for ages 4 and older. I agree with this age ranking. I think that there is a need to be careful with Frosty and not to be twisting legs or throwing him around and children younger than 4 years old might not treat Frosty with the care needed. Frosty needs 4 “AAA” batteries in his feet to work. 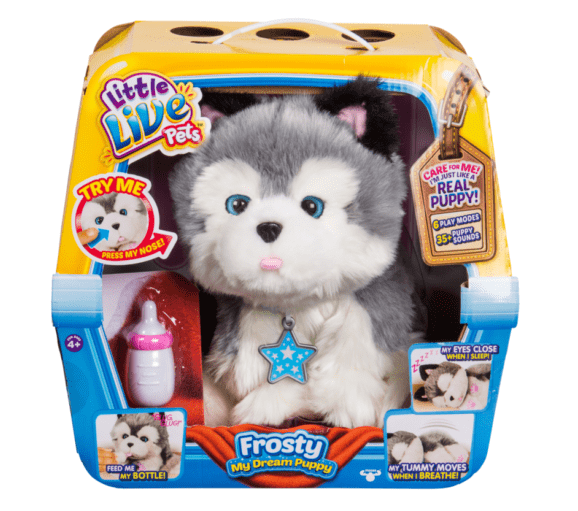 Frosty comes with batteries though so kids can start playing and taking care of their puppy right from the box. Frosty does come in test mode while in the box so you can see what he does a bit. You will have to put him into on mode when you take him out of the box. As far as battery life, so far so good as the batteries seem to be enough to power Frosty for quite some time. Really though as with any battery operated toy, battery life will depend on how much the product gets used. This is the first Little Live Pets product that we have tested out and I am very impressed by the quality and detail of the product. There is certainly an awesome adorable factor to Frosty who is a little huskie puppy. Look at my Little One here….you can see her glancing at her Frosty and it really shows how much she adores him…… 🙂 She actually had trouble pausing to let me take photos. My Dream Puppy Frosty can be found at your local Toys R US and Walmart. For those that are looking for an adorable kitten, there is a My Dream Kitten Cuddles as well. To find out more about the entire lineup of Little Live Pets products here….